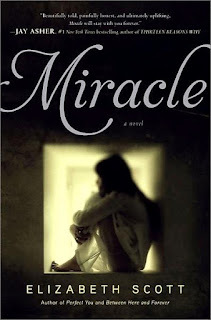 Scott, Elizabeth Miracle, 217 pgs. Simon Pulse, June 5, 2012. Language - PG (0 swears), Violence - PG13, Sexual Content - PG. When Megan Hathaway survives a plane crash against all odds, the only thing her family, friends, and teachers see is a miracle. They don't see that Megan, the sole survivor, is broken. Her memory of the crash is lost in a terrifying haze, she no longer has the ability or desire to relate to others, and she keeps seeing the victims of the crash around town - even though they are dead. Only the boy next door and a crusty Vietnam vet - both outcasts and victims of tragic pasts themselves - seem to understand her. Intense, sad, and ultimately uplifting, this story of Megan's post-crash struggle with PTSD shows that there is hope for those who have lived through tragedy. The characters' struggles to find balance and healing may encourage those suffering from depression to seek help. Megan's memories of the crash are described in unflinching and graphic detail, which could be difficult for some students. HS - ADVISABLE. Reviewed by: Caryn, Library Media Specialist.